Augustus the Strong’s hunting and pleasure palace is picturesquely situated on an island in the midst of a unique cultural landscape before the gates of Dresden. 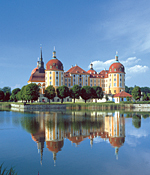 To this day, it has in its holdings precious leather wall coverings, furniture, porcelain, hunting trophies and the legendary “Moritzburg Feather Room” – an artwork consisting of more than a million different-coloured feathers. The castle also rose to fame as the setting for the Czech film “Three Gifts for Cinderella”. 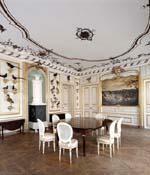 The winter exhibition of the same name is presently not on view but will be returning to Moritzburg Castle. 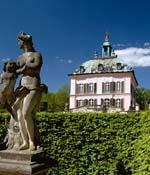 The enchanting Little Pheasant Castle is separated from the palace by a short romantic walk. 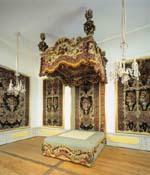 It is presumably the smallest royal castle in Saxony and nevertheless offers space for holding court “en miniature”. 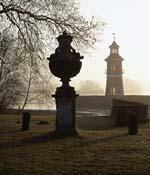 * The Historical Porcelain Quarter can only be seen on a guided tour. Special guided tours "From the Cellar to the Roof": January to December every Sunday at 13. ​Please note, only the exhibition "Three Hazelnuts for Cinderella" can be seen during this time. On Sundays at 13, also the special guided tour "From the Cellar to the Roof" is available. Same admission fees apply for the winter exhibition "Three Hazelnuts for Cinderella"